Without warning they arrived, looking just like a Pink Floyd album cover. Settling near many cities across the globe, these large ‘space bananas’ hovered gently. Motionless. Benign yet ominous, like Kanye West at an awards show. As the world watched on in fascination and terror, government agencies act decisively, forming a team of specialists to analyse and investigate. To decide upon the true intent of these newcomers. Louise Banks (Amy Adams) is a language specialist. Ian Donnelly (Jeremy Renner) is a mathematician. Finding kinship in confusion, they ultimately gain entry to the eggs under watchful eye of Colonal Weber (Forest Whitaker) and attempt to interact and understand. The further this went the deeper my brow furrowed. Sure I was engrossed at what I felt must soon unfurl, but simultaneously nervous that the revelations already made public might actually be the extent of it all. 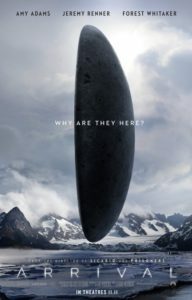 Arrival is well made but thin, and all too reminiscent of similarly perplexing and divisive sci-fi films such as Interstellar and Contact. Director Denis Villeneuve already has amassed an ambitious but flawed collection of movies this decade, with the powerful Prisoners and Sicario balanced out by a misstep with Enemy. Arrival sits somewhere in the middle. If it were made by a rookie we’d be discussing the promise of new talent, instead because of what has come before we hope that this isn’t an M Night Shyamalan like sign of an absence of new ideas. I have faith in Villeneuve, but hope his Blade Runner reboot validates that faith. Final Rating – 7 / 10. It’s good, but annoyingly not nearly as good as the director, cast and premise might indicate.